Bronchitis can be defined as an inflammation of the bronchi. It is also noted to be an infection of the lower respiratory tract which, in general, will follow an upper respiratory tract infection. Acute bronchitis is caused either by a viral or bacterial infection. It is characterized by coughing, the production of excessive amounts of mucopurulent sputum and narrowing of the bronchi due to spasmodic contractions. The respiratory passages also become inflamed and irritated. This illness is commonly one of a viral nature and is usually self-limiting. It may progress to pneumonia if unaddressed or if treatment is not effective. Episodes of this disease mainly occur in middle and adult life, however, both adults and children can acquire bronchitis. It is more common in males than females and is also more common amongst smokers than non-smokers. Symptoms are noted to be similar for both age groups. Bronchitis is usually a progressive disease and could possibly lead to respiratory failure if not treated effectively. Pertussis, commonly known as whooping cough, can also be seen to mimic acute bronchitis and is often under-diagnosed, leading to the need for differential diagnosis. Infants usually get bronchiolitis, which involves the smaller airways and causes symptoms similar to asthma. In general, an infant will lead a relatively protected life. It is therefore noted that respiratory infections will usually only become common once the child starts school. These infections may also be seen to be recurrent through the early school-going years as the body's defence mechanisms are still developing as the child grows. Acute bronchitis is generally caused by a viral infection. In patients younger than 1 year, the respiratory syncytial virus, parainfluenza virus and the coronavirus are noted to be the most common causes. In patients between 1 and 10 years, the parainfluenza virus, enterovirus, respiratory syncytial virus and rhinovirus dominate the causes of acute bronchitis. In patients older than 10 years, the influenza virus, respiratory syncytial virus and adenovirus are the most common causes. Acute bronchitis was first described in the 1800’s as the inflammation of the bronchial mucous membranes. Subsequently this inflammation has been noted to be the end result of a complex series of events. These events include an infectious or non-infectious trigger. This leads to the injury of the bronchial epithelium resulting in an inflammatory response with hyper-responsiveness of the airways and mucous production. 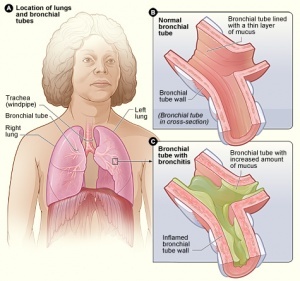 Bronchial wall repair takes a few weeks to occur. The patient will still suffer from a cough during these weeks. Half of the patients suffering from acute bronchitis will continue to cough for longer than 2 weeks and in a quarter of patients the cough will last for more than a month. Chronic bronchitis in children can be as result of two things: Excessive inflammation or continuous exposure to allergens or irrtants. This will result in a bronchospasm and cough. Later the airway will become inflamed with oedema and there will be mucous production(due to overactivity of mucous secreting glands. This mucous production can build up, covering the bronchial walls and in turn results in an obstruction being formed in the bronchioles. Therefore it can be said that chronic bronchitis in children is most probably diagnosed as asthma. Hypertrophy of the mucous glands in the bronchial wall. Increased number of goblet cells. Recurrent infection, especially in childhood could lead to chronic inflammatory changes, fibrosis, distortion and even ulceration. The small airways are often affected which is partly due to a loss of elastic support from the surrounding alveoli. Acute bronchitis is caused by viral and bacterial infections. This form of the disease may last up to several days, or even weeks. Some children may be more prone to the contraction of acute bronchitis than others and these include children with respiratory illnesses such as asthma and children exposed to high levels of airborne pollutants. The signs and symptoms of this disorder will depend on the severity of the disease as well as considering which stage the disease has been diagnosed. This just means that some symptoms may be present in some cases and may be absent in others. Coughing which will be dry, hacking and painful in the initial stages. Coughing later becomes productive with purulent sputum. Coarse crackles may be heard on auscultation. Difficulty in breathing due to narrowing of the bronchi. The liver may become palpable as it is displaced downwards due to overinflation. The breath sounds have a longer expiratory phase and there may be decreases air entry. Other added sounds that may be heard on auscultation include rhonchi and crackles. A study done by the School of Public Health and Family Medicine at the University of Cape Town (UCT), revealed that out of the sample population 2,3% of males and 2,8% of females had bronchitis. It was also found that the strongest predictor of this disease was a history of tuberculosis. Other predictors include smoking, occupational exposure, and other domestic exposure e.g exposed to smokey fuel and being underweight. The incidence rate of acute bronchitis in the United States of America (USA), according to www.wrongdiagnosis.com is approximately 1 in 21 or 4.60%, this is extrapolated out to 23 new cases per minute. The following statistics about acute bronchitis were posted on www.wrongdiagnosis.com and are all from the Hospital Episode Statistics, England Health Department and were all for the year 2002-2003. It was found that 0.017% of hospital consultant episodes were for acute bronchitis. 52% of hospital consultant episode were for men. The mean stay in hospital was 4.3 days and the mean age of hospitalised patients diagnosed with acute bronchitis was 40 years. The following results are shown as extrapolations of the research done in the USA and therefore the results are based on these methods. Just like any respiratory disorder, the diagnosis will start with the history of the patient, including all details pertaining to the disorder (exposure to irritants, including being exposed to second-hand smoke). Upon physical examination, decreased breath sounds, wheezing, rhonchi and prolonged expiration will be evident. Various tests can be used to diagnose bronchitis in patients who present with prolonged coughing and shortness of breath. This test is used to rule out pneumonia. 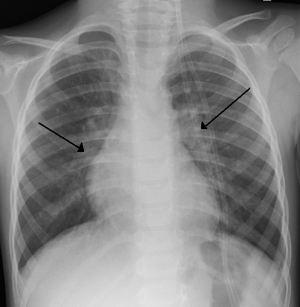 In bronchitis, the x-ray will show no evidence of lung infiltrates or consolidation. These tests include arterial blood gasses to test for levels of oxygen, carbon dioxide and acidity of the blood. This test will determine the amount of oxygen in the blood. An arterial blood gas test is more exact, but will be more painful and traumatic for the child. Pulmonary function tests are also known as lung function tests. These tests measure the amount of air ones' lungs can hold, the way your lungs function(moving oxygen into the lungs and carbon dioxide out of the lungs) and how quickly you can move air in and out of your lungs. The other advantages of these tests are that it can diagnose lung diseases, measure how severe the lung disease is and also evaluate how effective the treatments that have been administered are noted to be. The physical examination of patients presenting with symptoms of acute bronchitis should focus on the vital signs. These should include the presence or absence of pyrexia and tachypnea, and pulmonary signs such as wheezing, rhonchi, and prolonged expiration. Evidence of consolidation must be absent, or a diagnosis of pneumonia can be made. In general, the patient needs to rest, may need the use of antipyretics, should have adequate hydration, and should avoid smoke where possible. Some of the main objectives of treatment for this disorder will be to keep the bronchioles open and functioning, to facilitate the removal of secretions, to prevent disability and to improve one's quality of life as much as possible. It is extremely important to correctly manage cases of bronchitis. 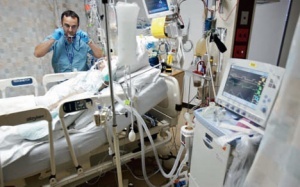 In the case of an emergency, a child suffering from acute bronchitis or the exacerbation of chronic bronchitis should be adequately oxygenated as this would be the primary medical intervention at the time, and most important. Antibiotics can be used to treat acute bronchitis caused by a bacterial infection. They are ineffective in the treatment of acute bronchitis caused by a virus however. The treatment for the viral form is commonly symptomatic, and can include analgesics for a sore throat, antipyretic medication for fever, and cough suppressants where deemed necessary and effective. A humidifier may also be used in order to increase the humidity of the air and ease dryness of the respiratory passages, which can cause excessive coughing due to irritation. In rare cases, the patient may be hospitalized if they experience breathing difficulty that doesn't respond to treatment. This usually occurs because of a complication of bronchitis, not bronchitis itself. These are used for the treatment of pain and fever and can be used to ease headaches caused by excessive coughing. Pertussive therapy is used in order to induce coughing as an aid for expectoration. Antitussives are used to control coughing, especially in cases if the cough is creating significant discomfort. The selection of an antitussive medication is dependent upon the cause of the cough. An antihistamine would be made use of to treat a cough caused by allergic rhinitis. A decongestant or an antihistamine would be utilized to treat a cough caused by a postnasal drip. And a bronchodilator when a cough results from the exacerbation of asthma. Non-specific antitussives are made use of to just suppress an unproductive, ineffective cough while not hampering the resolution of the infection. These prevent excessive coughing which would lead to pain and fatigue. Used in the treatment of acute bronchitis caused by a bacterial infection.In paediatrics ,antibiotics will only be used for bronchitis related to bacteria.Physicians will prescribe Amoxicillin to children younger than 8 years old. These may be beneficial in removal of sputum by mobilizing and aiding expectoration, preventing atelectasis and bronchospasm. This form of medical managemnet may be considered if conservative measures fail. An important aspect of child care and is an important defence mechanism against viral agents of disease and illness. According to Shepherd (1995), bronchitis is one of the main respiratory disorders during which a child will be referred for physiotherapy treatment. This can be exercised at an angle of 45º in prone and in side lying. This must first be cleared with the institution as necessary, as well as considering possible contra-indications such as a head injury. Percussions, shaking and vibrations can be used to mobilize secretions and aid expectoration. Once again, precautions and contra-indications are to be observed. Active Cycle of Breathing Techniques(ACBT) could be used in order to mobilize secretions. Teaching relaxed breathing techniques as well as diaphragmatic breathing to aid oxygenation and prevent respiratory distress. Full thoracic expansion must be emphasized which will aid oxygenation. The patient should be encouraged to aid the mobilization of secretions through coughing and deep breathing during the day. The patient, and family, should be advised that the patient needs to rest and avoid bronchial irritants where possible. This, however, does not exempt the patient from partaking in physiotherapeutic activities. Teaching the importance of nose blowing into a tissue and not swallowing the secretions as well as discarding the tissue safely after blowing their nose is important,s as this will prevent the spread of infection. The patient and family/caregiver should be advised that a dry cough may persist after the bronchitis has resolved due to irritation of the respiratory passages. A humidifier at the bedside may be useful in combating the negative after-effects as it will saturate the air that is breathed in. Treatment should be carried out 3 to 4 times a day depending on the severity of the condition. If an upper respiratory tract infection is contracted again, treatment should be started as soon as possible to prevent it from developing into bronchitis or further severe complications. The patient and/or family should be able to recognize early signs and symptoms of acute bronchitis and report them immediately. If an underlying lung disorder is not present, symptoms of acute bronchitis will usually subside within 7 to 10 days. A dry, hacking cough may however be present for several months after this allotted time. Acute bronchitis usually heals completely, therefore leading to an excellent prognosis. Bronchitis commonly begins with a dry cough, which can wake the patient up at night. This will progress to a cough, which is productive in nature, and may accompany symptoms such as pyrexia, malaise and a headache. These symptoms will only last for a few days, but the productive cough will last for several weeks. If any of the symptoms associated with this disorder should remain untreated or uncontrolled it could lead to secondary complications such as pneumonia. This would thus lead to a poorer prognosis. In paediatric bronchitis as well as other medical conditions, prevention is always better than cure. Hands should be washed regularly to avoid the spreading of any viruses and other infections. A hand should be placed over the mouth during coughing, and the washing ones' hands after a cough will aid in the removal of any viruses or germs on the hands. If this is not observed, it may lead to the spread of infection. If and where possible, exposure to air pollution should be reduced. Smoking near children should be prevented as secondary smoke can damage the bronchial tree and makes it easier for viruses to cause an infection. If the child is easily susceptible to contracting infections, contact with people who are already suffering from bronchitis should be avoided. Antimicrobial therapy should be administered at the first sign of purulent sputum. Children suffering from bronchitis should always have a balanced diet and healthy eating plan in order to keep their immune system in an optimal condition. This allows it to fight off infection and prevent the development of acute bronchitis, disrupting daily life along with general well-being.